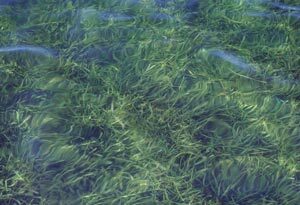 Seagrass beds, also known as submerged aquatic vegetation or SAV, are considered a foundation of coastal and estuarine ecosystems in the Northern Gulf Region. These highly productive marine plant communities provide valuable habitat and perform important ecosystem services in the waters that they populate. Seagrasses contribute significant value by providing several critical ecosystem services in the Northern Gulf Region. While there is no single estimate of the value of seagrasses in the region, several attributes demonstrate the importance of this habitat to both the aquatic ecosystem and to the local economy. Seagrass beds support important recreational and commercial fisheries critical to the economic and social well-being of the region. Finfish and shellfish use the beds as nursery habitat for rearing juveniles and foraging habitat for adults. They improve water quality by adding oxygen to the water column and filtering nutrients and contaminants from it. They stabilize sediments and reduce coastal erosion by baffling energy from waves and currents. Mobile Bay, designated a National Estuary by the Environmental Protection Agency, receives the waters of the Mobile Basin, the sixth largest watershed in the United States. Decreases in seagrass acreage have been reported in coastal Alabama, but, as of now, there has been no investigation into the specific causes that underlie these losses. The large declines in SAV coverage in Mobile Bay estuarine waters have been generally attributed to tropical weather activity, dredging, prop scarring, and turbidity in coastal waters related to land development practices that increase suspended sediments. The rapid development of coastal communities for residential and commercial purposes can cause harmful habitat changes to SAV communities. Beyond increasing nutrient loading, increased development is often accompanied by shoreline armoring that effectively diminishes critical shallow-water habitat. Examples include the construction of seawalls, breakwaters, revetments, groins, and jetties. Each of these structures, aimed at protecting coastal property, refracts energy away from the shore and can cause erosion and increase currents that disrupt SAV settlement. Development converts natural landscape to increased impervious surface which increases the volume and velocity of stormwater runoff, especially in a region that receives over five feet of rain per year on average. One result is stream bank erosion, an upland problem that delivers plumes of sediment into coastal waters. This is one more source of light-blocking turbidity which, along with nutrient-stimulated algal blooms and refracted wave energy from shoreline armoring, blocks the sunlight necessary to sustain SAV. MBNEP has partnered with the Alabama Department of Conservation and Natural Resources, State Lands Division, to monitor SAV coverage in the Mobile Bay estuary. SAV coverage in Mobile Bay and adjacent waters was first mapped in 2002. In 2005, that distribution was compared to historical aerial photography to determine that SAV acreage was, in fact, diminishing. SAV coverage was again mapped in 2008 and 2009, over a single-year duration, revealing a net loss of an additional 1,300 acres. Successful restoration of SAV is generally dependent upon improving water quality and reducing turbidity. Regulations controlling nutrient loading in southwest Florida have resulted in decreased concentrations of nitrogen and phosphorus in coastal waters, decreased algal blooms, increased water clarity, and increases in SAV coverage.